Let’s learn today how to separate hydrogen from water without electrolysis. Water being the most abundant substance on earth it could be the perfect fuel which would eliminate the need of burning the conventional fossil fuels. Using electrolysis as a method of hydrogen production demands high amounts of energy and is very inefficient. A lot of the energy consumed to separate the hydrogen and oxygen through electrolysis is lost in form of heat. This is why scientists are looking for new ways to separate hydrogen from water without electrolysis. I will show you today how hydrogen can be separated from water in three different ways. First we will say something about the method which makes the largest amounts of hydrogen. Called steam reforming this reaction can’t be done at home. Next we will say some words about the reaction of a highly reactive metal with water, the aluminum-water reaction in the presence of sodium hydroxide. Last but safest method to make hydrogen, we will learn how to separate hydrogen from water without electrolysis using just aluminum and water without any other chemical agents. The cheapest method of separating hydrogen from water used today on a large scale is steam reforming. This involves high temperatures ranging temperatures from 1300 to 2000 degrees Fahrenheit. At such high temperatures water vapor reacts with natural gas (methane) resulting hydrogen and carbon monoxide. Unfortunately steam reforming can’t be done with small homemade installations because it involves high temperature, high pressure and methane gas. Usually the hydrogen made with steam reforming is used directly on site for the production of methanol. One simple way to make hydrogen at home is the reaction between aluminum and water. Aluminum is very reactive but the aluminum oxide layer forming on it’s surface keeps water making direct contact with aluminum particles. To overcome this sodium hydroxide can be added to water to continually disrupt the aluminum oxide from it’s surface. The aluminum and water reaction in the presence of lye (caustic soda) is violent and exothermic. Caution should be taken when dealing with lye as it can burn your skin. A variation of this method is to change lye for muriatic acid (hydrochloric acid). To understand how to separate hydrogen from water without electrolysis, using the reaction of aluminum and water in the presence of lye or muriatic acid you should conduct the reaction in open space, wearing at least protective glasses and chemically resistant gloves. To control the reaction, small amounts of aluminum should be input into the reactor. The reactor should be made of thick glass knowing that plastic will melt at high temperatures, like in the image above. The hose coming out of the reactor flask should go deep in another bottle of water to clean the hydrogen of lye particles or acid vapor. Let me tell you how to separate hydrogen from water without electrolysis, without any dangerous techniques. This is most useful if you need to separate very small amounts of hydrogen from water. This involves just a glass bottle which can sit in upside-down position, some aluminum foil, a tray and water. First fill up the tray with water. Crumple the aluminum foil to make a small ball and insert it into the bottle. Fill up the bottle with water, pouring the water on top of the small aluminum ball. Place the bottle in upside-down position in the tray full of water being without allowing air inside and let it sit on it’s neck. Tap the bottle with your finger to help it. Wait for 24 hours to accumulate hydrogen. After you’ve waited enough time (roughly 24 hours depending on the size of your bottle) you will observe that some gas has appeared inside the bottle. To prove that this gas is hydrogen turn the bottle in upright position and light the gas with a lighter. If it burns means it was hydrogen. We’ve seen how to separate hydrogen from water without electrolysis. One method is industrial and can’t be replicated at home. 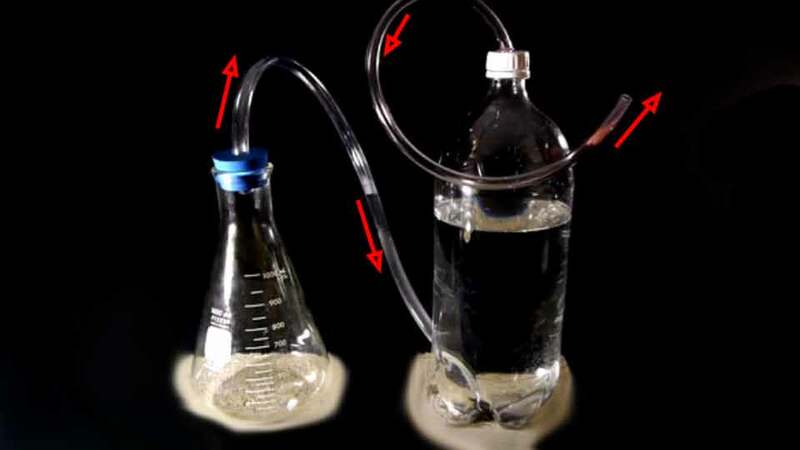 Second method of extracting hydrogen from water can be done at home with caution. The last method can be done by every kid, it is fun and makes them more interested in science (adult supervision advised). Next please check my other article how tobuild a hydrogen generator.